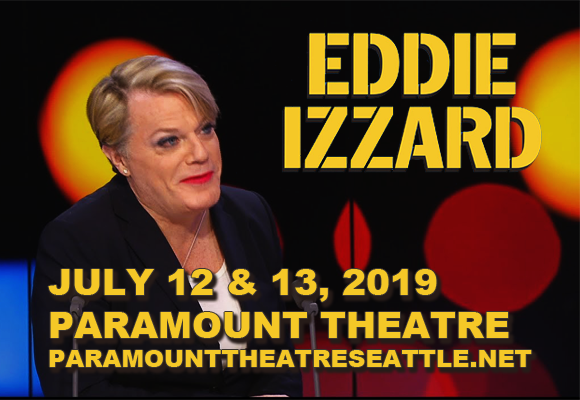 Embarking on his first full-length tour since his record-breaking stint six years ago, legendary British comedian Eddie Izzard comes to Paramount Theatre Seattle on Saturday 13th July 2019 with Wunderbar! The evening's entertainment promises to be a ‘rather personal show which expands on his own very unique, totally surreal view of life, love, history and his theory of the universe’, and no doubt will include the whimsical flights of fancy and interwoven comedic threads that this innovative and hilarious comic is known for! English stand-up comedian, actor, writer and political activist Eddie Izzard is best known for his eccentric, sprawling and somewhat slapstick comedic style, which marries caricatured physical comedy with cerebral, self-referential humor. Izzard began his career in the 1980s as a street performer in Europe and the United States, before moving on to stand-up comedy, making his first stage appearance at the Comedy Store in London in 1987. He has released ten comedy specials to date and in 2007 he was listed as number 3 of the 100 Greatest British National Comedians as part of British television station Channel 4's ongoing 100 Greatest…, series. Izzard has won numerous awards, including a Primetime Emmy Award for Individual Performance in a Variety or Music Program for his comedy special Dress to Kill, in 2000. In addition to his comedic career, Izzard has appeared in a number of films, including Ocean's Twelve, Ocean's Thirteen, Mystery Men, Shadow of the Vampire, The Cat's Meow, Across the Universe, Valkyrie and Victoria & Abdul, and he has a starring role in the television series The Riches. He has also leant his voice to several animated films, such as The Wild, Igor, The Chronicles of Narnia: Prince Caspian, Cars 2 and The Lego Batman Movie. In 2009, he received the BBC Sports Personality of the Year Award for completing 43 marathons in 51 days for Sport Relief with only five weeks' training and no previous history of long-distance running, and in 2016 he raised £1.35M for Sport Relief after running 27 marathons in 27 days through South Africa.